The sound of crickets chirping evokes a strange atmosphere during night time. Sonic experimentations of how cricket chirps sound like at various speed resulted gave way to a shocking discovery. 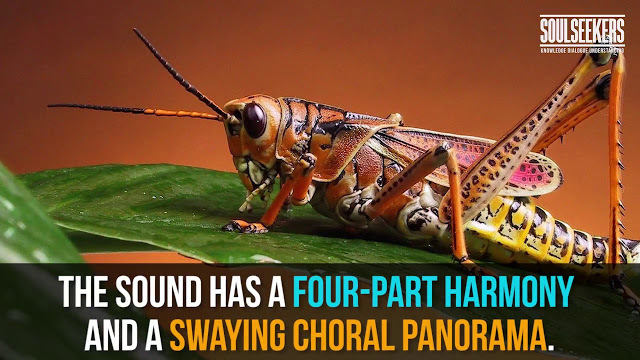 When slowed down, a cricket chirp sounds like one of the most beautiful sounds created by nature. A musician named Jim Wilson started experimenting in 1992. Crickets produce their iconic sound by flapping their wings. We wondered how crickets sound like if their chirps are slowed down. He found out that crickets produce a haunting tone that is similar to an orchestral choir. Skeptics tried to recreate Jim Wilson's God's Chorus piece, but they failed. This led to the speculation that the God's chorus piece is just a hoax or Jim Wilson experimented with sampling and synthesizers to achieve the sound of slowed down cricket chirps. You can listen to the alleged true sound of crickets played in slow motion.